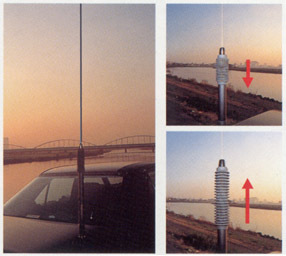 The Yaesu ATAS-100 Active Tuning Antenna System provides HF/VHF/UHF coverage with automatic motorized tuning. Utilizing control signals from the transceivers microprocessor received via the coaxial cable, the ATAS-100's internal motor adjusts the radiator length for best SWR. The ATAS-100 covers the 7, 14, 21, 28, 50, 144 and 430 MHz amateur bands and is compatible with the FT-100 and FT-847. M type mount is used. This antenna is approximately 5.25 feet high. Triplexer required (not supplied). Copyright 2001-2006 Universal Radio, Inc.